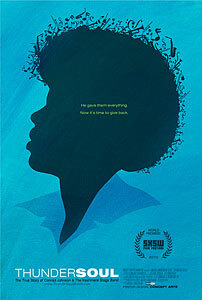 Thunder Soul (Director: Mark Landsman): Winner of the Audience Award at this year’s Hot Docs Canadian International Documentary Film Festival, Landsman’s profile of the Kashmere Stage Band and its iconic leader Conrad O. “Prof” Johnson wisely keeps the music front and centre. In the early 1970s, Kashmere High School in Houston, Texas was the home of a unique musical experiment. Music teacher “Prof” Johnson began to incorporate the funk and R&B music his students were listening to into the school band’s repertoire in the late 1960s, and a few years later, the all-black band were winning competitions all over the United States against other school bands who played mostly “soft jazz” or “big band” music. About ten years ago, record label owner and funk archivist Eothen “Egon” Alapatt discovered some old vinyl LPs the band self-produced strictly for historical purposes. Working with “Prof” he was able to put out the compilation Texas Thunder Soul 1968-1974 which went on to become a hit, especially among DJs who eagerly sampled the band’s music in their own work. The filmmaker came along just as some members of the old band were planning a reunion to honour “Prof,” now 92 and in ill health. More than two dozen members from the band’s most acclaimed period reunited, despite the fact that some of them hadn’t played any musical instrument in more than 30 years. But as “Prof” boasts in the film, he taught them so well that it would all come back to them, and the climax of the film is the reunited band’s performance, still fresh and funky after all these years. It’s a tribute to “Prof” but it’s also a powerful document about what arts education can mean to students. During the period of the band’s success, other programs and teams at the school also excelled, and the graduation rate soared. Sadly, the school’s band now struggles along with just 8 students and a criminally small budget. Landsman’s hope for the film is not only to honour mentors like “Prof” but to advocate for better funding of arts education in the public schools. His job is made easier by the sheer joy and bounce of the music and of the people playing it. This entry was posted in Documentaries, Film Festivals, Hot Docs and tagged #hotdocs10, education, funk, music. Bookmark the permalink.